To heat, with direct contact, a number of fluids such as water, oil, acidic and basic solutions and viscous materials. Even though these heating elements are immersed within fluids, it is still possible to use electric heating elements whilst reaching the maximum energetic efficiency. The immersion heater is also available with a variety of mounting options, such as; through plug, flanged, over-the-side and many more. We can also provide immersion heaters for hazardous appliances as well as flameproof (ATEX) heaters or those needed in environments with pressure above 40 bar. 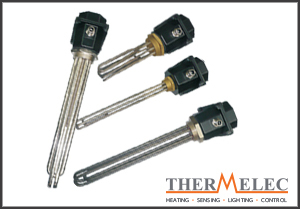 Here at Thermelec we can provide a wide array of immersion heaters to suit the needs of the application, with the bonus of being able to provide bespoke sizes and specs. Circulation heaters are perfect for the immediate heating of processing fluid (including hazardous liquids) whilst maintaining a flow rate. 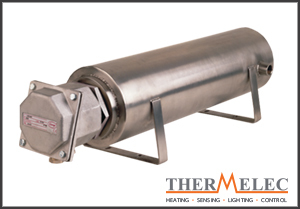 These heaters simply transfer heat generated from electric power into the target fluid instead of exhausting heat from another source (as per a heat exchanger). These heaters are easy to maintain and easy to install and have a high range compatibility with our other immersion heaters. The heat loss is reduced by its stainless steel and anti-corrosion metallic vessel chamber.